Our Pensacola Beach, Florida hotel offers a beautiful, uncrowded, beach front location. 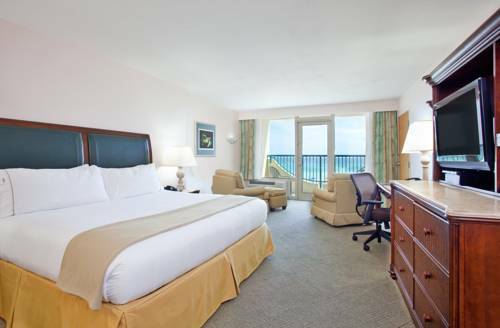 With every room overlooking the Gulf of Mexico, the Holiday Inn Express Pensacola Beach is 100% nonsmoking and offers comfortable accommodations and spectacular scenery. Every hotel room features a private Gulf front balcony. Whether you are in Pensacola Beach for business or leisure, our hotel provides a premiere location and complimentary breakfast. The white sands of the Gulf of Mexico are literally in our backyard. Fort Pickens National Seashore is a few miles from our hotel on Pensacola Beach. Diving, fishing, snorkeling and boating are fun activities nearby, and Portofino Beach Boardwalk, within walking distance, offers shops and restaurants. Our great island location provides you with endless possibilities. Getting to meetings and conventions is easy as the Pensacola Civic Center is eight miles from our hotel in Pensacola, Florida. The Pensacola State College, Pensacola Christian College and Naval Air Station Pensacola are 15 miles away. Our hotel near Pensacola International Airport (PNS) is the perfect place to stay during your business trip or vacation. Our award winning staff works to assure a most relaxing and memorable stay. Come Stay Smart with us at the Holiday Inn Express Pensacola Beach, and see why it said the only thing we overlook is the Gulf of Mexico. Portofino BoardwalkStroll along the Boardwalk overlooking Intercoastal Waterway, Santa Rosa Sound, and stop at Alvins Island Tropical Department Store, Go Fish, International Boutique, Lee Tracy's, and other unique island shops. Geronimo's OutpostA consignment shop of many artists, jewelers, clothiers, and craftsmen, Geronimo's Outpost is as unique as Pensacola Beach. Cordova MallAn upscale mall featuring stores such as Dillard's, Liz Claiborne, Jos A Banks, Anne Taylor's Loft, Victoria's Secret, Bed Bath and Beyond, World Market, Sunglass Hut, and Best Buy. Tiger Point Golf and Country ClubChallenging Jerry Pate designed 18 hole PGA course. Island green on 5 and water hazards abound. 20,000 sq. ft. clubhouse with meeting and banquet facilities. National Naval Aviation Museum and IMAX TheaterExplore an aircraft carrier, discover Main Street USA on the WWII homefront, and test your skills in a dogfight at one of the world's largest aviation museums. Admission is free. Restaurant on site and IMAX Theater. Veterans Memorial ParkHome of the Wall South, a replica of the Vietnam Memorial in Washington D.C. this park honors veterans of all of America's wars. In addition to the wall there is a WWI memorial and a Vietnam-era Huey helicopter. T.T. Wentworth Jr. Florida State MuseumAritifacts and information for hours of intrigue. Features the history of Northwest Florida's occupation by French, Spanish, British, and Confederate troops over the past 500 years. Childrens "hands on" museum, too. Horizon Beach ServiceLocated on the beach in front of the hotel, Horizon Beach Service rents beach chairs, umbrellas, stand up paddle boards, kayaks, skim boards and will give surf lessons on days there is surf (fall & spring). Closed in winter.